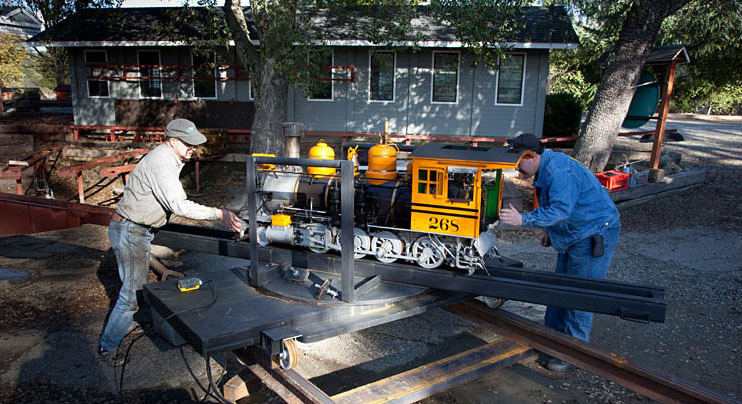 Live coal and propane powered steam locomotives in 1.5" scale through 2.5" scales as well as diesels, electrics, gasoline and human powered engines are all in use on the railroad. Both our Main Yard and adjacent North Yard are situated along a large scenic pond and are immediately adjacent to facilities for loading/unloading and storage of rolling stock, steaming bays, a station house, passenger loading areas, tool sheds, picnic and grilling facilities. Members and guests are often treated to views of wild life including deer, turkeys, ducks, coyotes, cows and a dog or two. The Main Yard has three tracks for passenger loading and unloading next to the mainline pass-through track. 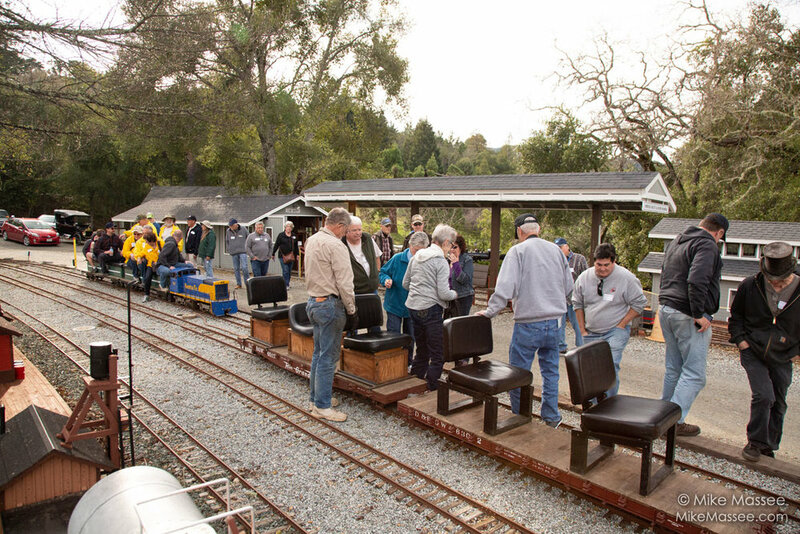 The yard has covered seating for passengers waiting to board and is adjacent to our engine and car storage facilities, the station house, steaming bays, and our tool sheds. The Main Yard connects into the North Yard which contains additional car storage and is designed to handle single consists over 200’ long—significantly longer that what the Main Yard can hold without blocking other trains and the mainline. 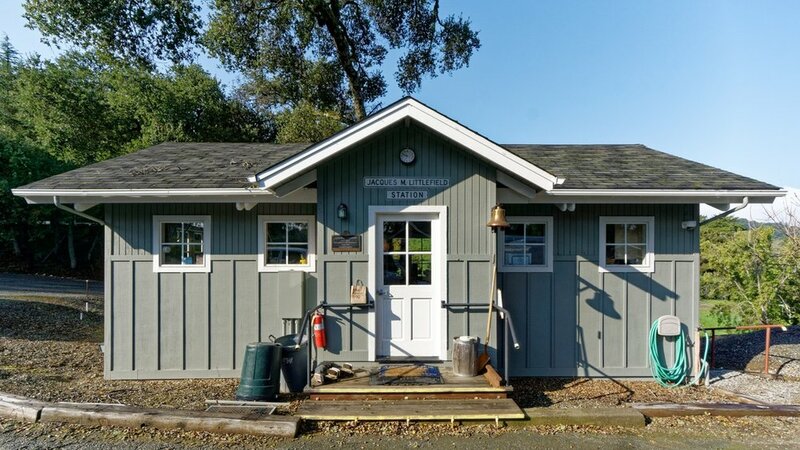 This is our station house with full kitchen, bathroom, and a large common area for meetings and meals. This is where we gather for lunch on workdays, and have board and design committee meetings. It is open on all run and workdays. 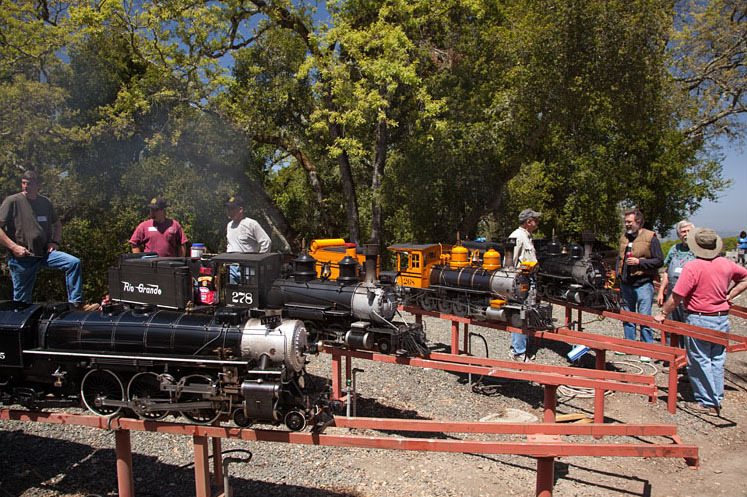 The railroad has 9 steaming bays arrayed around a turntable so we can handle a large number of engines when we host meets. Steaming bays are immediately accessible from our loading and engine storage facilities. The unloading area has space for two vehicles at a time and a second turntable makes getting into the steaming bays and out onto the track an easy process. A secondary unloading track is also available for cars and engines not needing to go to the steaming bays and are light enough to man handle onto the auxiliary track. The railroad has a number of onsite storage facilities with easy access to the track. Members in good standing who agree to run their engines and stock a few times a year can use on-site storage as part of their membership. Our storage capacity was significantly expanded in 2019 with the addition of the Ron Schmidt Car Barn which contains 150’ of storage track freeing up room in our engine houses. 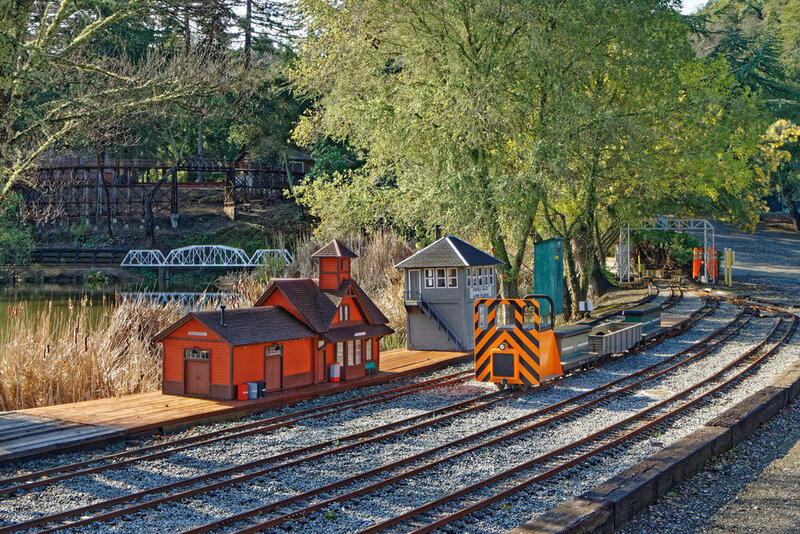 Engine House 2 was expanded in 2018 with the addition of a few more tracks for smaller scale engines and both engine houses have access to an electric lift to move stock to the turntable and main rails. Loading area/turntables, steaming bays, track to engine houses and track to main and north yards. Turn table / lift used to move trains from steaming bay to the yard track. 2 x BBQ = lots of cooking power.